Is a specific insecticide for "earth-wall" treatments. 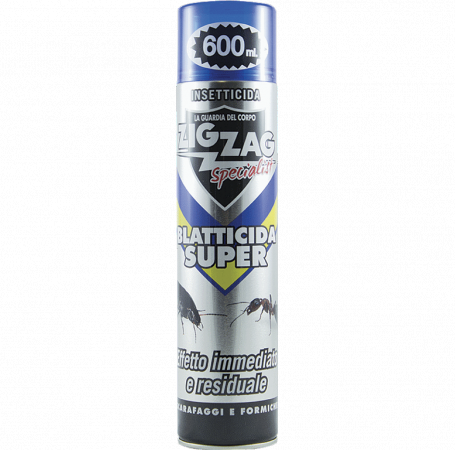 Against all crawling insects it has aprolonged residual action (up to 30 days), effective immediately (15-45 sec. ), Besidesflushing action. Notes: The special long-spin button allows spraying the product even inside cracks and interstices of walls and skirting boards, and hitting an insect even a few yards away. Shake well before use. Dispose of the product directly on the insect to be removed or on the edge of the floor, skirting boards, cracks, furniture, along the pipelines and wherever stationary or transit roaches, ants, spiders ... for no more than 2 sec. per square meter. And taking care to dispense the product from a minimum distance of 20/30 cm., In uniform quantity, without visibly watering the surface. Foods and food containers. Of flame or any incandescent material. It should not besprayed in the air.